Happy Saturday Everyone! It's time for me to share a new card made with products from the Classy Cards N Such Online Store. My card size today is 5.5 x 5.5. You'll find that I have a flair for the square! I started with a dark rust card base. Then I found this lovely vintage rose pattern in the Glitz Designs Happy Travels Paper Pack. I distressed the edges of the paper and then inked them with Rusty Hinge Distress Ink. Using some orange paper I die-cut the Lacey Pumpkin Corner Flourish from Cheery Lynn Designs and added that to the lower left corner of my card. If you are wondering why it's so shiny, it's because I went over it with the Sakura Glaze Pen. I wanted shine without added dimension and this is the way to get it. Using my trusty Spellbinders Labels Eighteen I die-cut two labels; one for my Scripture and one for a mat. I distressed the edges of both of these also with Rusty Hinge Distress Ink. I used a ribbon slot punch to make a slot in the top of the larger label. Then I ran two different colors of organza ribbon through them and tied a little knot. To finish it off, I added one Prima Gillian flower in cider to the lower right hand corner of the label. 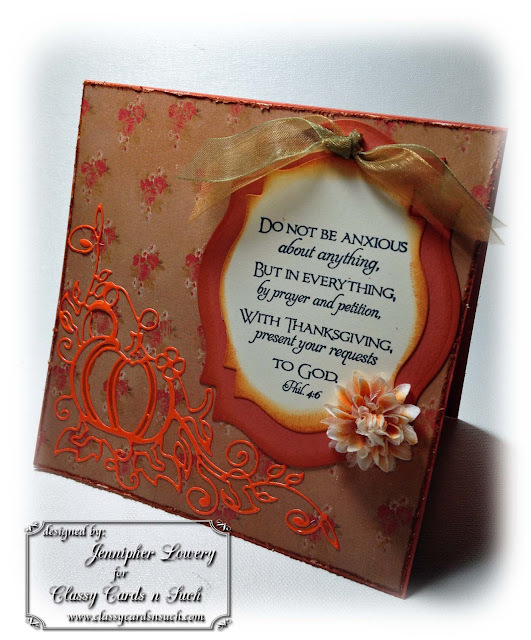 I would like to enter this card into the Shining Light Challenge at Our Daily Bread Designs: use fall colors and a verse. My Scripture on my card comes from their Scripture Collection 4. I hope you are inspired to create some fall cards and send some fall blessings to your friends. Beautiful card, Jenn. I love the sentiment. Another Beautiful creation Jennipher!! I just love that verse and your sticker pumpkin is the perfect touch. Gorgeous Fall card!! Thanks for joining the ODBD Shining the light challenge this week!! Beautiful fall colors! Love the pumpkin! This is such a perfect card for Thanksgiving and the harvest season. I love the effect of the glaze pen on the die cut and your flower is so pretty too! Beautiful sentiment, and fall card as well! That pumpkin diecut is gorgeous.